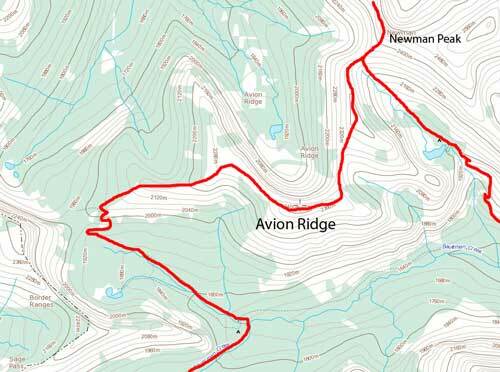 After finishing Newman Peak and Spionkop Ridge, Eric and I hiked towards our next objective, namely Avion Ridge. These three peaks together make a good combo for peak-baggers and they’re all well documented in Andrew Nugara’s More Scrambles in the Canadian Rockies. 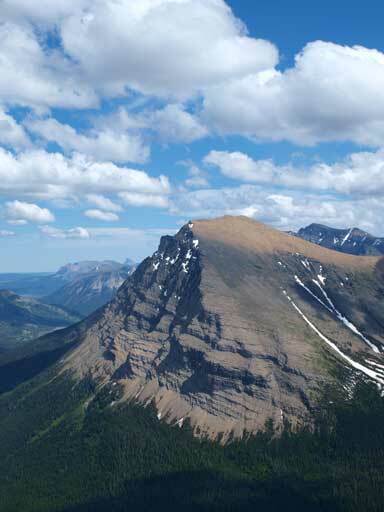 “Easy scrambling” is the dominate terrain in this part of the Waterton and the views are incredibly scenic. The route on Gem Trek map shows skirting around the first summit, but we didn’t feel like doing this. We’d like to stay on the ridge top. We did get some interesting views from the first summit of Avion Ridge, especially the forested snow and trees, with the red rock in background. 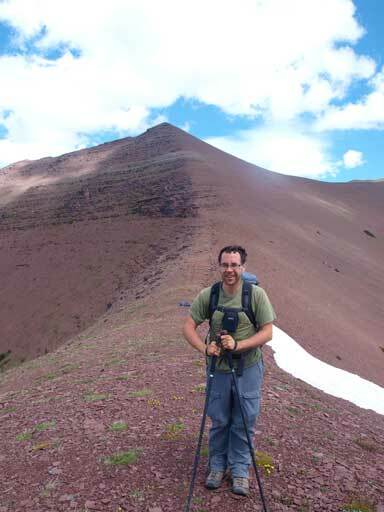 To get to the true summit of Avion Ridge, we had to descend about 100m to a col. The scree ski was pleasant and fast. We met Jeff’s group again on the way up to the true summit. The true summit is just right of center. It’s hard to tell if that’s higher or not. We bagged both so we are safe. Kenow Mountain and Miskwasini Peak at center. 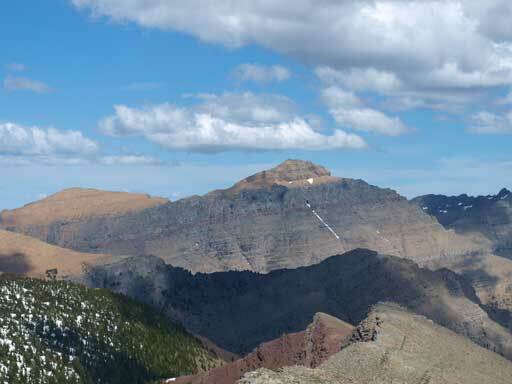 Starvation Peak on the far left. On the summit of Avion Ridge we had some brief discussion for the rest of this day. 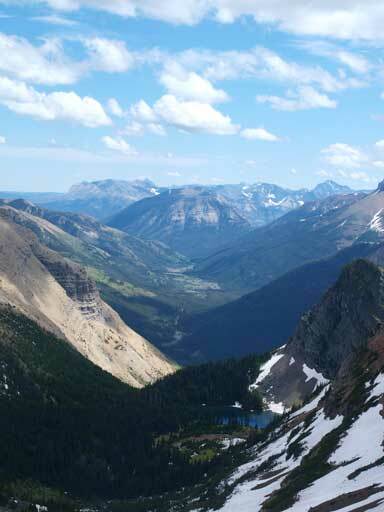 On a near-windless day in Waterton, it’s worth to push on. It was already 3PM, and we had to make an important decision now. 3. 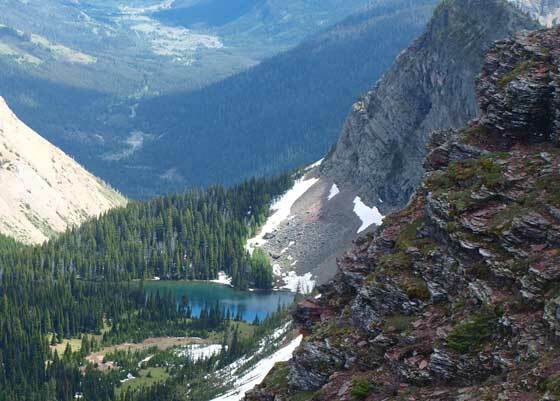 Get to Sage Pass, grab several unnamed summits on the continental divide and Kishinena Peak, and go back via Blakiston Valley. 4. 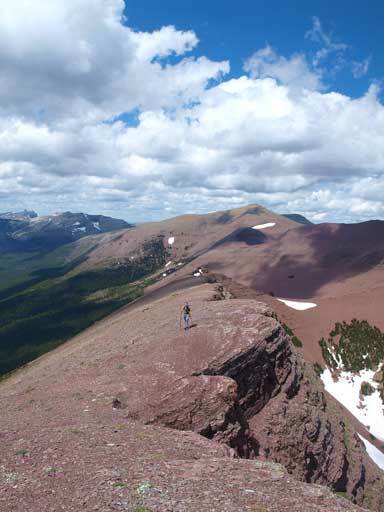 Get to Bauerman Divide, do the Anderson – Bauerman traverse reversely, get back via Blakiston Valley. Option 1 was very unimpressive and less ambitious. We both felt optimistic about energy and time so our goal was to at least get to Twin Lakes and make the final decision at there. 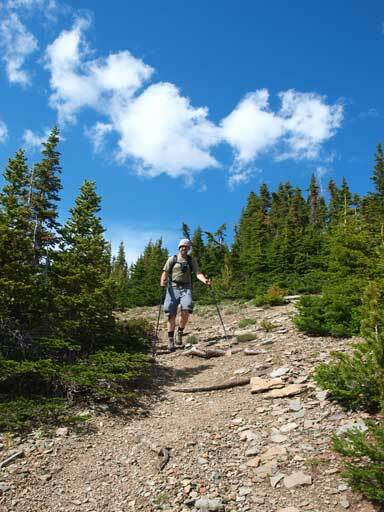 There was a trail leading us down the other side of Avion Ridge towards Castle River Divide. The trail was snowbound at places but a good set of tracks helped a lot. We got a good glance towards Lost Lake and Twin Lakes, and our destination, Bauerman Divide looked quite far away. And we had to drop all the way down to valley floor first. Once getting down into the forest, we lost the views but on the bridge side we did knock off the kilometers at a faster pace. From the low point (where we intersected the Snowshoe Trail) it was a 3.5 km trudge to Twin Lakes. This didn’t sound overly outrageous on paper so we kept going. Well, for some reason we both felt optimistic and energetic probably because this was our first trip in Waterton, so the decision was made. 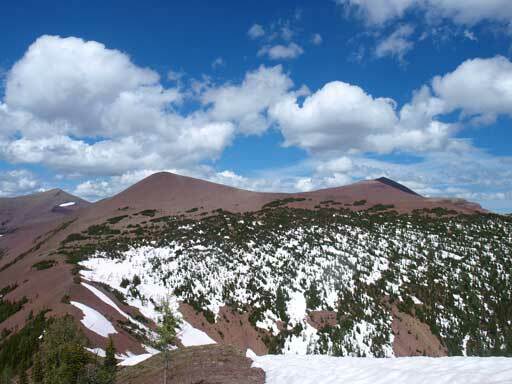 Let’s reverse the Anderton – Bauerman 4-peak traverse starting from Mount Bauerman.